Three individuals with residences in Abuja and Lagos own the company that has been fingered in the illegal importation of arms into the country earlier in the week, investigation by DailyTrust has shown. 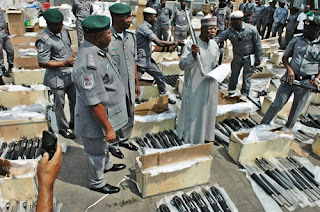 The Nigeria Customs Service, on Thursday, named Great James Oil and Gas Ltd as the importer of the haul of 470 guns that was impounded at the Tin Can Island port last week, a week after a consignment of 1,100 weapons belonging to the same firm was seized at the same port. The Comptroller-General, Col Hameed Ali (rtd), said Great James Oil and Gas Ltd used a vessel, AVS Arkas Africa, to ferry the weapons into Nigeria. The Customs boss did not name the owners of the company. Investigation on Sunday revealed that Ayogu Cyril, Ayogu Kelvin and Ayogu Great James registered the oil firm as its directors on July 20, 2011. The company was registered with RC 968675. The three directors used residential addresses in Kaura District of the Federal Capital Territory and Bariga area in Lagos, respectively, to register the business. Cyril and Great James gave the address of a residential apartment, Suite 4, 4th Avenue, Prince and Princess Estate in Kaura District, Abuja while Kelvin gave the address of a residential apartment at No. 25 Bariga Road. When our reporters visited the address in Abuja yesterday, a guard informed them that the male occupant was at home with his wife. But he declined their request to speak with his employer, holding that his boss was not expecting any visitor. A vehicle was seen parked in front of the building. The guard, and another adult male, denied knowledge of the said oil and gas firm or the occupant’s link to it. He later went in and returned with a response, saying his boss was equally unaware of the said firm. Other people spoken to in the area said they had no knowledge OF what the occupant was doing for a living, and others doubted if he had a firm named Great James Oil and Gas Ltd.
“The owner is from the South-East, but his name is not James Ayogu or Cyril Ayogu and it is strange the company you associate with him,” a resident of the area said. At No 25, Bariga Road, in the Bariga Local Development Area of Lagos State, given as the residence of Kelvin is a brown one-storey affair of six three bedroom apartments. Checks on Sunday showed the building is mainly residential. All but one of the tenants were out when our correspondent visited there yesterday. A chat with the only person, who wouldn’t give his name, said Kelvin actually lived there but had packed out to his own house about two years ago. He said he didn’t know the address of Kelvin’s present residence. On Thursday, the Customs CG said the firm used the elbow plumbing plastic that it declared in the bill of lading to deceive officials about the concealed weapons. He said the 470 weapons were found after officers had subjected the 20-foot container No. CMAU189817/8 to 100 per cent examination. A meeting was scheduled Friday between Nigerian officials and their Turkish counterparts to discuss the rise in arms shipment to Nigeria from Turkey. A total of 2,671 rifles, in four batches, were seized within the last eight months, all coming from Turkey, according to the Nigeria Customs Service. Hameed Ali said his agency and other security outfits were investigating the reasons for the massive importation of arms into the country. “We are yet to get to the bottom of the whole thing. Are these arms meant for commercial purposes, or meant to be given to a group of insurgents or agitators and kidnappers?” he said.